Today's announcement of the passing of The Fall frontman Mark E Smith is the latest in a sad string of deaths in the music world, following the recent news regarding Dolores O'Riordan of The Cranberries and emo-inspired US rapper-but-maybe-not Lil Peep. We'll be focussing on the latter today, and this posthumous collaboration with dance producer Marshmello acts as a fitting celebration of Lil Peep's talent. Check out 'Spotlight' below. Marshmello (finally revealed to be Chris Comstock in 2017) quickly established himself as an electronic music mainstay, with bouncy tracks like 2016's 'Alone' dominating gyms and clubs across the lands. Lil Peep was also very much making waves, with his lo-fi genre-bending style attracting controversy and curiosity alongside several million hits across multiple platforms. 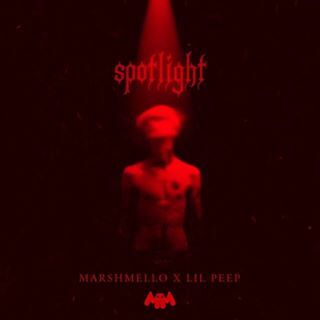 So it's in unfortunate circumstances that 'Spotlight' finds its way into the world - indeed some initial criticism for its release was only quelled after Marshmello explained that it was Lil Peep's mother's wish for the track to come out. With that out the way, it's also unfortunate that the track wasn't completed at the time of passing, but nonetheless in this eventual release, Lil Peep's yearning vocals are terrifically accompanied by Marshmello's marauding beats and instrumentation. Find out more info via lilpeep.party and marshmellomusic.com.